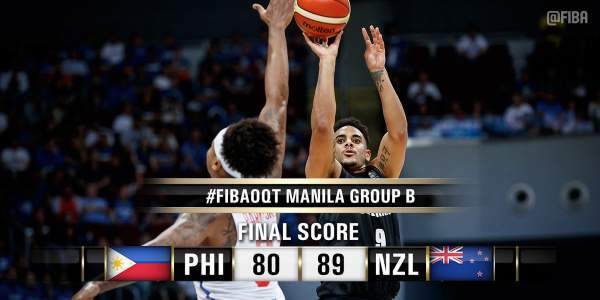 Video Highlights: New Zealand eliminates Gilas Pilipinas | 2016 #FIBAOQT - Balita Boss! New Zealand defeated Gilas Pilipinas 89-80 to eliminate the host country from the 2016 FIBA Olympic Qualifying Tournament. Philippines failed to secure the country's first Olympic appearance in basketball since 1972. The Gilas Pilipinas ended its campaign without a victory after also losing their first game against France on Tuesday. The Webster brothers Tai and Corey topped the Tall Blacks with 25 and 23 points, respectively. Tai added 11 rebounds and 3 assists. Andray Blatche carried the fight for Philippines, scoring a game-high 30 points. Jason William Castro finished with 13 points, three assists, and two rebounds in what could be his final game for Gilas Pilipinas. New Zealand will next face France tomorrow with the winner entering the semifinals as the top seed for Group B. NEW ZEALAND 89 - T. Webster 25, C. Webster 23, Fotu 17, Abercrombie 13, Bukona 6, Ili 2, Bartlett 2, Loe 1, Anthony 0, Karena 0. PHILIPPINES 80 - Blatche 30, Castro 13, Fajardo 11, Chan 11, Rosario 7, Romeo 5, Reyes 2, Parks 1, Norwood 0, Pingris 0, Aguilar 0, De Ocampo 0.